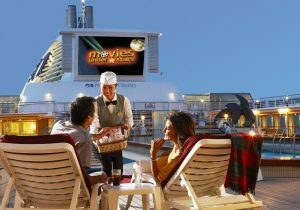 Princess Cruises is set to shine the spotlight on Australian cinema during its second Travelling Film Festival at Sea on Dawn Princess in November. Cinema buffs will be able to enjoy a selection of special film screenings curated by Sydney Film Festival Director Nashen Moodley, during the ship’s five-night roundtrip cruise from Sydney to Tasmania. The films on offer will include Mr Holmes, Phoenix and Iris. The floating festival is unique to Princess and a key part of the cruise line’s ongoing partnership with Sydney Film Festival. “Our inaugural Travelling Film Festival was a smash hit and with a great line up of talent on offer during this cruise we’re sure the sequel will be just as popular,” Mr Allison said. Fares for the Travelling Film Festival cruise onboard Dawn Princess, departing Sydney on November 1, 2016 and calling at Port Arthur and Hobart, start from $749* per person twin share. For more information, visit a licensed travel agent, call 13 24 88, or visit www.princess.com.